Eddie Rambeau was born Edward Cletus Fluri, in 1943. His birthplace was Hazelton, Pennsylvania. He is an singer, songwriter, actor and author. Rambeau sang at record hops in Hazelton where he impressed deejays with his talent. One of the deejays, Jim Ward, set up an audition for Rambeau at Swan Records. He was signed to the label and released his first single, “Skin Divin’”, under his new name, Eddie Rambeau, on graduation day in June 1961. The song made the Top 20 in several radio markets in Idaho and Massachusetts. In 1962, Rambeau recorded two more singles, “My Four Leaf Clover Love” and “Summertime Guy”. “Summertime Guy” was a song written by Chuck Barris, an employee of ABC TV. Eddie Rambeau recorded the song in 1962 and was in the line-up for a spot on American Bandstand. However, this was in the era of the Payola scandal where radio DJ’s had been paid money to play certain records on their radio shows. ABC was sensitive to any appearance of favoring a record written, composed or produced by an employee of ABC that would appear on a TV show on the network. Consequently, Rambeau was pulled from the American Bandstand airing. In addition there was no airplay of the song on ABC syndicated radio stations in the USA. As a result the song failed to crack the Hot 100 on the Billboard charts. Although it peaked at #3 in Boston. Nonetheless, north of the border, “Summertime Guy” received airplay on CFUN and climbed all the way to #3 in Vancouver. The song was re-recorded as an instrumental and featured as the theme tune for a show Chuck Barris would host called The Newlywed Game. Barris also hosted the Dating Game and the Gong Show. 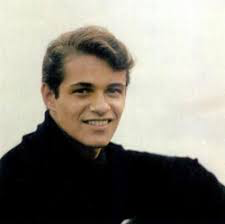 Barris also wrote “Palisades Park”, a Top Ten hit for Freddie Cannon in 1962 that peaked at #1 in Vancouver. In 1963, Eddie Rambeau recorded several duets with Pittsburg native, Marcy Jo. She’d previously had a hit in Pennsylvania and in Vancouver, in 1961, titled “Ronnie“. 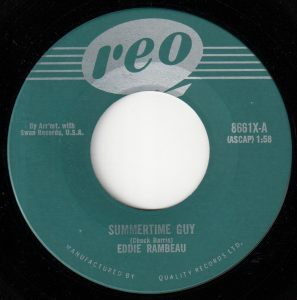 Although he missed having a national hit in America with “Summertime Guy”, Eddie Rambeau wrote “Navy Blue”. The song is about a gal who is all broke up because her “steady boy said ‘ship ahoy,’ and joined the nay-ay-vy.” “Navy Blue” was recorded by Diane Renay and became a #6 hit on the Billboard Hot 100 and #5 in Vancouver in March 1964. He wrote several followup releases for Diane Renay that year. In 1965, Eddie Rambeau covered a tune by the UK band, Unit Four plus Two, titled “Concrete And Clay“. It made the Top 40 on the national charts in the USA and #5 in Vancouver. Rambeau went on to become an actor as part of the caste of the Broadway musical, Hair. Later, he also was caste in the musical, Jesus Christ Superstar. In his book, Sal Mineo: A Biography, Michael Gregg Michaud details how Mineo’s six-year relationship with Courtney Burr III included Mineo putting up with a side affair between Burr and Eddie Rambeau. Burr and Rambeau had met while costarring in the off-Broadway play, Norman, Is That You? prior to its brief run at the Lyceum theatre in February 1970. In 1972, Eddie Rambeau got a role in an off-Broadway play titled Tubscript, a gay comedy. In the 1970’s, Rambeau established a management company and had a disco group from the New York City area, called the Front Runners, record a disco version of Miss Toni Fisher’s 1960 hit, “The Big Hurt”. In 2011, Rambeau published his first novel, a murder-mystery called Forbidden Steps. The plot concerns a 22-year old top male model named Chad who is going back home to be at his dad’s funeral. Eddie Rambeau also has appeared on the TV soap opera, Guiding Light, according to the author notes on the back cover of his murder-mystery novel. In addition, Eddie Rambeau has developed a talent for painting and photography. Eddie Rambeau, Shindig!, ABC-TV, 1965. Michaud, Michael Gregg. Sal Mineo: A Biography. Three Rivers Press, New York, 2010. pp. 326-327 ff. Rambeau, Ed. Forbidden Steps. 2011. Kendra Cherry, What Does Your Favorite Season Say About Your Personality?, Very Well Mind.com, January 13, 2018. Norman, Is That You? Wikipedia.org.